I love margaritas as much as the next person (okay, maybe more) but there are times when all I want is a paloma. 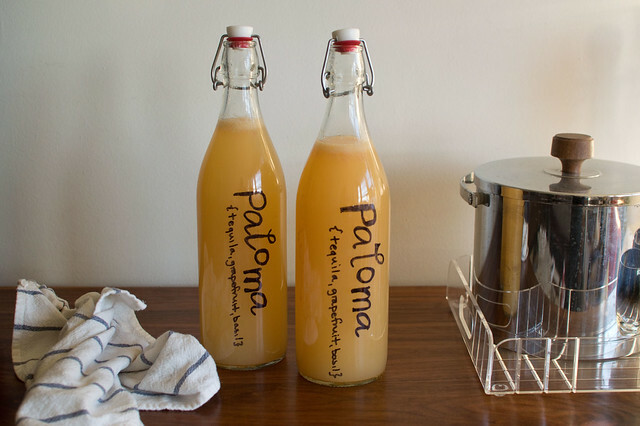 Palomas are sort of like stripped down margaritas, consisting mainly of grapefruit and tequila. You can make them in various ways, the least fancy of which is just silver tequila and Squirt. On Saturday we were going to a party so I wanted something relatively quick that I could pack up and take as a pitcher cocktail. I started with this Rick Bayless recipe but because we were using fresh grapefruit juice (I get it from the Trader Joe's refrigerated section) that has basically no sweetness, I knew we'd need to play with it. I swapped in a little bit of tangerine juice to balance out the grapefruit juice and then made a basil simple syrup instead of just using regular sugar, which I find never dissolves well. This cocktail will take a bit of adjusting because so much depends on your juice. Have a tasting glass nearby and take tiny sips as you go along so you can get it where you want it. :: Mix the juice and the tequila together. Add simple syrup to taste. I think I ended up using about 1/3 cup, just enough to take the edge off the grapefruit. If you are using bottled grapefruit juice, which is sweeter, you might not need any syrup at all. If you prefer a sweeter drink, you may need quite a bit more. :: You can either top with the sparkling water or have it available for people to add to their liking. How much water you add will mostly be determined by the setting. If I were pouring a round of cocktails pre-dinner at home, I might add just a splash of water. But when I make pitcher drinks for parties I tend to use more. People drink more at a party and they drink faster so I find it's better to make the drinks a little lighter so they can sip longer. If you taste as you mix and stick with flavored water, you'll ensure that it doesn't end up tasting watered down, just refreshing. :: Bring the water and sugar to a gentle boil, stirring to make sure the sugar dissolves. Toss in the basil leaves, stir, and turn off the heat. Allow to cool before straining. You can keep the leftovers in the fridge for a week or two. If you don't have basil, leave it out and just make regular simple syrup. I always use my flip top bottles when I bring drinks to a party. I write on them with a black sharpie, including a short description of the drink so that people hunting through the cooler can decide if it appeals to them The sharpie will come off with soap and water when you're ready to wash it. I absolutely love your cocktail recipes especially since I've started bringing batches of cocktails to parties rather than the regular vodka + mixer. I'll have to taste test this over the weekend. Aaaaand, I love the flip top bottles as well. I bought a few years ago and use them for everything. I have these great bottle brushes that work perfectly on them! I'm not sure where they came from because I've had them for years, but I have three different sizes and they're long enough that I can get to the bottom of the bottles. I usually put a little soapy water in the bottle, cap it, shake it vigorously and pour it out, then add a little more soap and use the bottle brush to scrub the inside. Works like a charm and they come out nice and clean. They do take a while to dry, but I just leave them upside down in our dish drainer. Thanks for the recipes, I love Paloma's (and easy margariats in general). Really have been enjoying the frequent posts, I know life is super busy but you always have great stuff to share!